Cooking a meal you saw in a fast-paced Facebook video or just stocking up the kitchen for the month – these grocery stores have everything from sizeable varieties of everyday needs to gourmet options like cheese cellars and seafood. This is one of the most extensive (and luxurious) grocery stores you’ll come across. They’ve got cheese cellars, a salt bar with over 100 types of salts and spices, exotic berries from Europe, healthy food options and everyday groceries. Did we mention the live candy counter? You’re going to be spending a while here. The one in East of Kailash is two floors full of grocery bliss. You’ll find preapred and fresh meat options—even seafood, an aisle full of sauces (think pasta sauce, Thai curry mix, diet sauces), and a fresh lot of every kinda fruit and veggies. 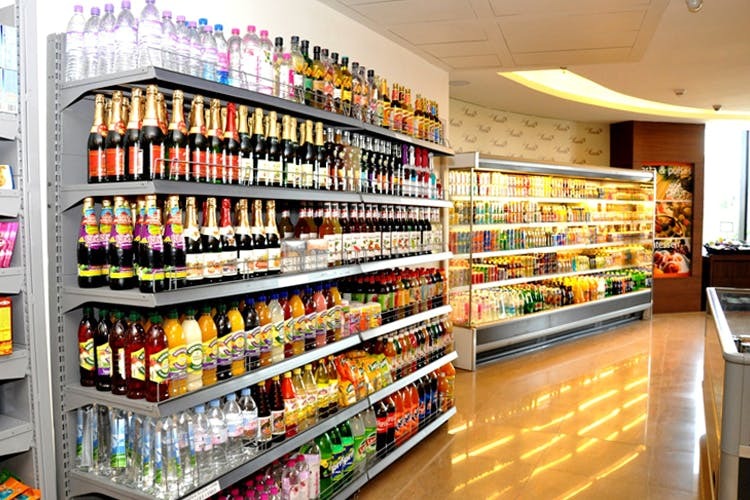 They’ve also got a big ice-cream section – and all the imported goodies you could want. Gourmet meal in the making? Le Marche is the kind of place where you’ll find those hard-to-find ingredients. They’ve got an amazing bakery area, where you’ll get baking supplies as well as ready-to-eat desserts. You also get a solid variety of frozen and marinated meats, poultry, and seafood. Psst! They do home delivery as well. If you enjoy getting lost in a grocery store amidst all that food, Spar is where you need to go—it is massive. Looking for those 5-kilo cereal boxes (the huge ones)? They’ve got it. Fresh fruit, meat, freshly-baked bread, confectionery—the works. They’ve even got cooking utensils. You can basically stock the whole kitchen straight from here. Staple foods, fresh foods and veggies, organic options and a big beverages section—Daily Needs has all your… well, daily needs and then some. They’ve got an online marketplace, too, for days when you don’t want to leave home. Check it out here.